B'shBLOGestra: B'shnorkestra Premieres Global Concertos in May 2015! B'shnorkestra Premieres Global Concertos in May 2015! 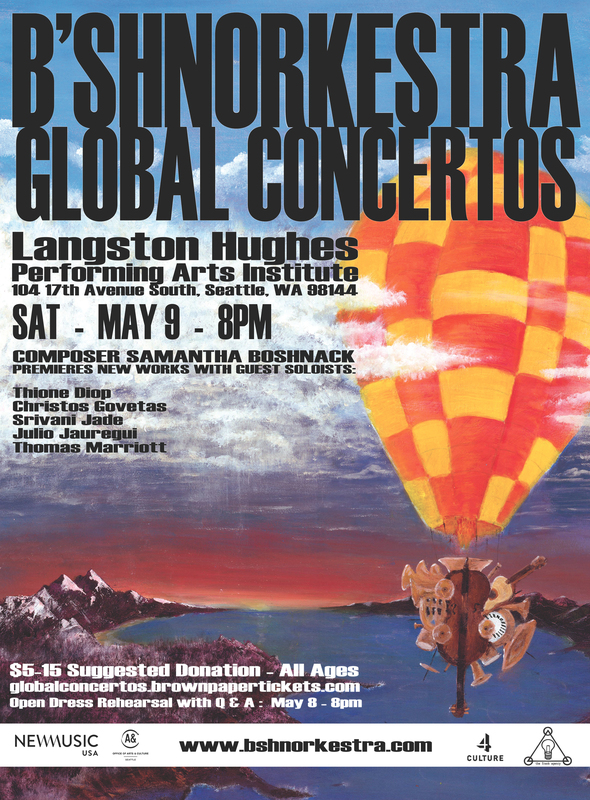 Composer Samantha Boshnack and her B’shnorkestra (a 14-piece alternative chamber orchestra) premiere Global Concertos: an evening of new music featuring an international tour de force of soloists. Boshnack has written five new works, each showcasing a guest soloist’s instrument and tradition: Thione Diop – West African talking drum, Christos Govetas – Greek clarinet, Srivani Jade – North Indian vocals, Julio Jauregui – Latin American piano and Thomas Marriott – American jazz trumpet. In Global Concertos each artist brings their individual voice to the B’shnorkestra to create a new “all world” sound. Global Concertos was made possible, in part by funding from New Music USA, 4Culture and Seattle Office of Arts and Culture.